I hope everyone had a great Christmas and good break from work. I had a lovely dinner on Christmas Day with close friends and a generally relaxing time, catching up on reading (books and internet) and tv. Was back in work on 29th – that was a bit of a shock to the system! 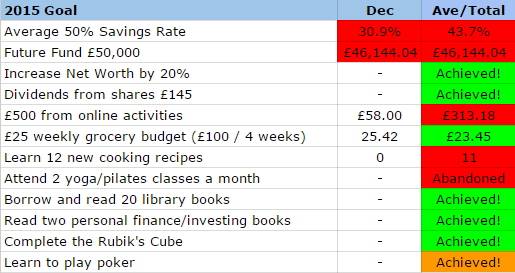 So how did I do in December savings-wise and how have I done versus the goals I set at the start of the year? I saved 31.5%. Not quite as bad as I thought in the end. 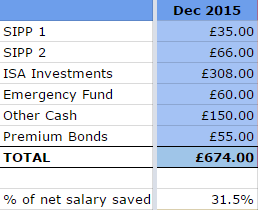 This has meant that my average savings for 2015 was therefore 43.7% so goal failed! I’m a little bit disappointed that I’ve missed my target again but well, I gave it a good go and will continue at it! The amount saved was boosted by £58 from TopCashback*, £25 premium bond winnings and £50 rent received. My Future Fund now stands at £57,530.57. If I don’t take into account the private pension transfer, it stands at £46,144, so goal failed. However, I’m very happy with how it is progressing, although any growth has mostly been attributed to money I’ve put in rather than growth from investments. 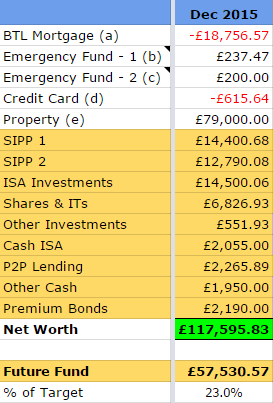 Net Worth is now £117,595.83, an increase of just over 31% from the start of the year so goal achieved. A seemingly big jump, mostly I’d say due to the increase in valuation of my rental property – it seems even properties ‘up north’ can go up in value! I received £2.15 from Scottish Mortgage IT, £4.57 from BP, £27.14 from Lancashire Holdings Ltd, £14.65 from Vanguard World High Dividend ETF, £2.15 from Vanguard Government Bond, £13.88 from Vanguard FTSE 100 ETF, £20.46 from Vanguard All World ETF and finally, £0.71 from Temple Bar IT. I topped up on City of London Investment Trust and also acquired some more Standard Chartered shares in the recent Rights Issue. As I want to increase my dividend income, I intend to make more purchases/top ups, but need to ensure I don’t deviate too much from my main investing strategy so will continue to invest in index tracker funds and also ETFs (which will help with dividends too). Check out my current portfolio here. Food/Groceries Budget – I spent £101.69 this month, only slightly over my budget, averaging £25.42 per week. My average weekly spend this year was £23.45 so goal achieved, am pleased with this one as this was where my spending can easily spiral out of control without me noticing. Cooking Recipes – goal failed! I actually thought I was going to bag this one but I lost a weekend when I was unwell (and didn’t eat anything) and realised that I’d run out of weekends to try something new! 11 out of 12 isn’t too bad I guess but how annoying! Online Earnings – Another payout from TopCashback as listed above but with a 2015 total of £313.18 earned, goal failed. Still, that’s over £300 that went towards my savings/investments via very little effort and I think that was probably the issue – I expended too little effort towards this goal. I won’t be setting so many goals for 2016, I think I ended up a little distracted and sidetracked, and I certainly won’t just throw in another goal just because I’d achieved one goal rather quicker than I thought I would (eg the Rubik’s Cube one). And thanks very much to all who have taken the time to read and to post comments on my blog this past year – your support, encouragement and ideas have been very much appreciated, thank you! Wishing you all a happy and prosperous 2016! This entry was posted in Blog Update, Dividend Investing, Earnings, Funds, Investment Trusts, Net Worth, P2P, Portfolio, Savings, Shares by weenie. Bookmark the permalink. Re the yoga/pilates goal, not that I know why it was abandoned as am only a recent follower of your blog, but I have always assumed taking up yoga or pilates meant doing classes, which I have never got round to doing anything about. However, this year I bought a good yoga and a good pilates book and have been doing both from that – not as often as I should due to recent minor ill health, but will resume as soon as I’m better. Thanks Cathy – happy New Year and hope you had a great Christmas! Yes, my yoga/pilates goal had been specifically to attend classes on top of my usual gym sessions. However, the classes were late in the evening or on Sundays. If I’d been better organised with my time, I probably could have achieved this one. I think I do have a couple of yoga books so I might just start doing that, so good call. Thanks for the kind words – I’ve set myself similar goals for 2016 (just drafting the post!) and hopefully will be up for the challenges ahead! hi weenie, I also found the classes weren’t on at a great time but also yoga classes all seem to be an hour and a half, which is probably great from an exercise point of view but just makes them harder to fit in! Not enough time to do everything, sadly. Here’s to a great 2016! I’m sure we’ll both be surprised by the end of the year about the progress we’ll have made again. PS: digging the new blog layout! 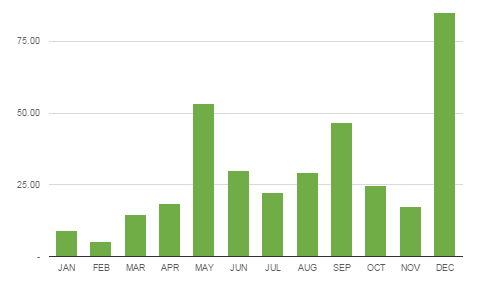 Thanks and yes, 2015 was a big year for me, the first full year of my FI journey! It would have been brilliant had I hit all my goals but if I had, then perhaps they were too easy! Hey Weenie, Congrats on the dividend income you received for 2015. I have just started my journey towards financial independence. Having received my first dividend payment, it definitely makes a change to paying money to companies all the time. Even though you aid you failed on your savings goal, 31.5% is still a relatively high figure and one you should be proud off! Money Grower UK recently posted…The Best High Interest Bank Current Accounts in 2016! Thanks. It’s been just over a year since I received my first dividend payment and I’m really happy with the progress I’ve made so far. I look forward to increasing that gradually over the years. Yes, 31.5% is still a good savings rate, just not good compared to the goal I’d set myself, haha! I see you have a blog yourself – I’ll swing by to check it out. Haha, yeah, I went for a variety of goals last year and whilst they were fun, they were also too much of a distraction at times! This year’s will be a bit more traditional in a PF sort of way, haha! I always make time for reading, if only to give my eyes a rest from pc/laptop/tablet/mobile phone! Even reading on my Kindle is a rest for my eyes – it’s an old one so has no back-lit screen. Thanks Berry, all the best to you too! I would say 2015 was a great success all around. Great job Weenie! Goals help to keep us accountable and increase the chances of success. If you publicly announce them, it increases the chances yet further, which is exactly what you’re doing. I know first hand that it can be a little intimidating to do it, so good on you for putting yourself out there an progressing like you have. Cheers Huw – I was happy with my achievements in 2015. Just need to knuckle down and make sure I carry on like this to continue making solid progress and to build up my future fund. If I didn’t have this blog, I doubt I would make the same sort of progress, thanks for your continued support!